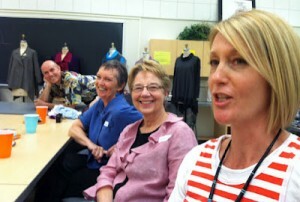 Bay Area fashion bloggers congregated at the college on Monday, Aug. 13 to share ideas about fashion and blogging. Special guest included Sara Alm, teacher and author of Fabulous Frocks; Wayne Wichern, teacher and owner of Wayne Wichern Millinery; Lynda Maynard, teacher and author of Couture Sewing Techniques; and Ronda Chaney, head of the Fashion Department at the college. "It was a fabulous event with lots of sharing on fashion design along with blogging," said Chaney. "It was a great way to connect with former students and the bloggers were able meet each other and share ideas. In some cases, they had never met before." "I am an alumnus of the Cañada College Fashion Department - having attended in the early 1980s," wrote Sharon a.k.a. Shams, author of the Communing with Fabric blog. "It's clear to me that Ronda has done amazing things with this department and that it is as good, if not better, as in "my" day."